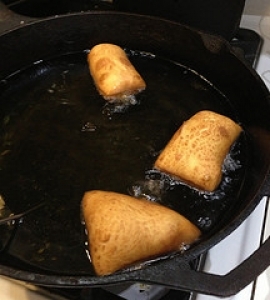 Have you made Beignets (Binyees)? 1. In pan, over med heat, combine h20, butter, sugar, and salt. 2. boil and stir until butter melts Add flour all at once. 3. cook over low heat until forms into a ball Remove from heat, beat in eggs, until smooth and shiny.